The Mazda Miata has been rear-wheel drive for its entire 30-year existence, as most people believe a proper sports car should be. But the new Mazda 3 will have all-wheel-drive for the first time. 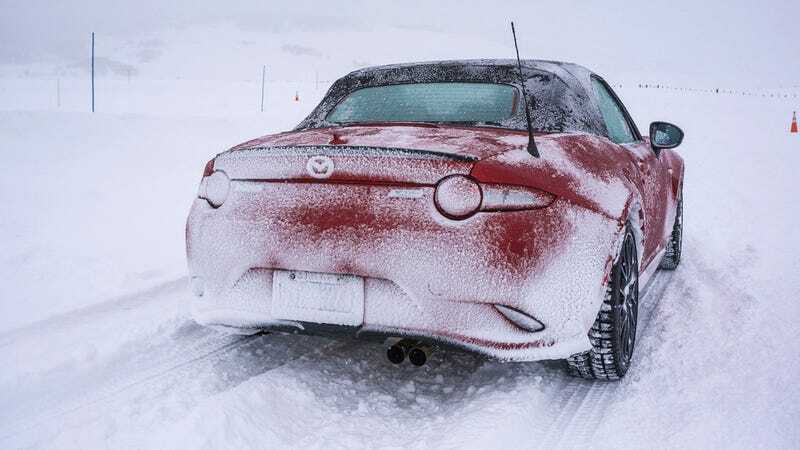 This got me wondering if an all-wheel-drive Miata isn’t the worst idea after all—and if Mazda could even pull it off. What Do You Want to Know About the All-Wheel Drive 2019 Mazda 3? I can hear what you’re saying now: that’s a terrible idea because it would probably add weight, and screw up the driving dynamics. And why would you fix something that isn’t broken to begin with? And Mazda has a new system called G-Vectoring Control Plus that takes this idea a step forward, incorporating braking movements in addition to wheel-by-wheel power changes to add traction in slippery conditions. This system is on the CX-5, and Mazda says it’ll eventually roll out to all of its cars, including Miata. Which means the Miata would have another aid to help the driver. Which means that in a few years’ time you’re going punch only a few million buttons to get back to the “pure” driving experience, for those who even remember what that was to begin with. So why not just go all-in and make an all-wheel-drive Miata, anyway? My proposal: Make the RF version the AWD variant, since the RF version is the expensive, heavier option already, with the soft-top staying rear-wheel-drive, now and forever. The enthusiasts all buy the soft-top anyway, and the RF I’ve always taken to be intended for people who might actually want AWD. And you could, in theory, tell this system to be rear-wheel-drive biased, and probably also train it to only kick in when the car senses slippery conditions like snow and ice. Think, too, about what everyone else is doing, and about the fact that Mazda has recently taken steps to become a more “premium” brand, because you know what else has had all-wheel-drive for a while now? The Porsche 911. One more thing: If there’s any company that I’d “trust” to make an AWD Miata correctly, it’s Mazda, who has been among the biggest skeptics of autonomous driving, and doesn’t really have the resources for it anyway, so the company has almost every incentive to get driving dynamics right. So yes, do let Mazda know you feel in the comments.